I gotta be honest: my brain is pretty fried this weekend. After each sentence I type here I find myself staring off into space snatching some microsleep. Ya ever feel like, sometimes, you get spread too thin, trying to take on too many things at once? What am I talking about, of course you do. You’re human; I’m human. It’s a human thing. What I’m getting at is that my level of creativity, my capacity to offer Ah-ha moments on this blog is round about nill today. Sorry, guys. But rather than leave you with nothing, I thought I might review a little of what I’m working on currently. Who knows, perhaps one of you readers out there might find a smidgen of interest tucked away in this blog today. In my day-to-day labwork I’ve been focusing on a mutant mouse model that targets Noggin overexpression to Cre-expressing cells. It’s kind of complicated to explain how that works, but basically it’s two separate mutations (the loxP and the Cre) that, when inherited in the same mouse, target your gene product of interest (e.g., Noggin) but only in those cells which also express the Cre. Think of its as a genetic lock-and-key system allowing scientists to alter target gene expressions in specific cell types, either turning up or down their production. 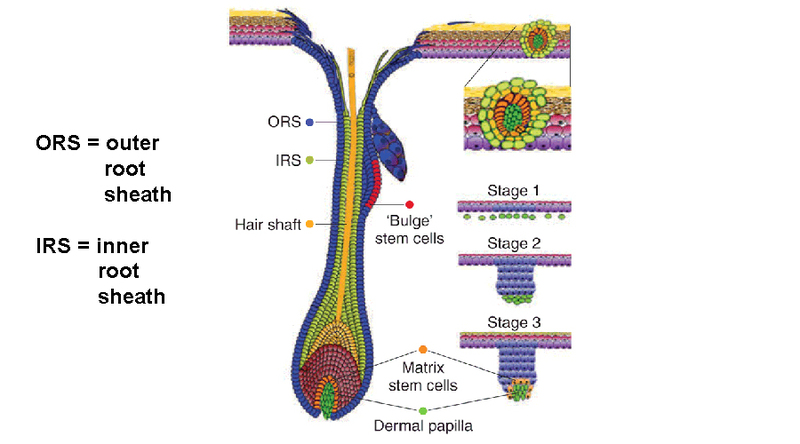 In the case of this mouse, the Cre is expressed in the inner and outer root sheaths and sebaceous glands of the hair follicle, which means that cells within those structures overexpress (make more than the usual amount of) the protein, Noggin. The first and most obvious expression in my mouse model is loss of hair starting between postnatal days 10-13. What is Noggin? Noggin is a protein which is released extracellularly (outside the cell) and acts as a receptor antagonist to the BMP pathways. Noggin competes with BMP molecules to dock in the BMP receptors. Although BMPs play a number of roles throughout the life cycle, in stem cells and progenitors they tend to have a pro-differentiative effect, meaning that they drive cells towards a greater degree of maturation. So when this pathway is inhibited in stem cells, it tends to promote an expansion of the stem cell pool but meanwhile prevents proper development of the more mature tissues which the stem cells would normally be producing. In other words, it can promote “dysplasia,” which is an expansion of immature cells and a subsequent decrease in mature cells. Should this tissue be held in such a state for any considerable length of time, the risk for tumor development becomes greater and greater. And this is exactly what I’m seeing in my own mouse model, that by 6 months of age these mice have developed tumors and multifocal neoplasms within the skin. That doesn’t mean necessarily that these neoplasms are cancerous, but the more neoplasms that develop, the risk of developing at least one malignant growth increases. It’s like playing the Cancer Lottery: you can’t win if you don’t play the game and the more often you play, the greater your chances to win increase. Although in this instance, if you “win” you lose. Another of my projects which I’ve written about much more extensively is my attempt at quantifying common underlying characteristics in those genes with high-association to autism. The first step in that process involved transposable element (TE) content in autism (for more, see our earlier publication, Williams et al., 2013). As a short recap, we found that autism genes were far more likely to house TE content, especially large content, compared to randomized control genes. While doing this work, one thing I noticed was that there was an overrepresentation of very large genes in the autism group, which made me wonder about links between gene size, TE insertions over the eons, and gene stability. Along these lines, King et al. (2013) published findings regarding long genes in autism back in September (fortunately for them, unfortunately for me, alas!). Thankfully, the data I’m currently working with involves much more than TE content and gene length and, unlike the King et al. study, doesn’t focus on gene expression. I hope that it will instead give a fuller picture about WHY autism-linked genes tend to have these characteristics. It will go much more in depth in regards to gene stability over evolutionary time and, I hope, help us understand whether the majority of these autism-related genes are causally or perhaps only secondarily linked to the conditions, so stay tuned. Anyways, that’s my life at the moment. Trying to juggle two very different projects at once, somehow attempting to fit “life” in there somewhere and snag a little rest at night. The house could certainly be a bit cleaner… a few massive dust bunnies (or should I say “cat bunnies”?) building in the corners… several carpets gone unvacuumed a wee too long. Oh well. What don’t we sacrifice for science, eh? If it’s a passion, the dust bunnies be damned. ← How Might Autism & Diabetes Be Related?